Imagine a place somewhere in the middle of the forest where everywhere you look there’s a fairy tale like detail that makes you wonder if you’re at a fantasy theme park. Insert thousands of ravers dressed up in all colors, outfits and props you can think of. Place 7 unique stages with non-stop electronic music, production unlike any other and top notch energy. To set it apart from the past two years, let’s add a light drizzle and mud for days. This was the formula for TomorrowWorld’s third year at Chattahoochee Hills, Georgia. Making my way through the thick Georgia forest for that one hour ride from Atlanta consisted of intense pre partying before arriving to a skyloft feet above the dance floor, hovering over the massive stage that had been imported from belgium’s Tomorrowland. The steampunk themed mainstage had a working watermill that was constantly overlooked. It was only second to the fire guns, everlasting confetti cannons and extensive firework shows going off around characters dancing around in picturesque outfits. Deciding to camp at the venue among thousands of others that were going to be calling Dreamville their home for the next couple of days, I made my way through a boardwalk that ran across miles of wobbly tents, food trucks, vendors and interesting characters. The misty rain that had been going on since my arrival was not too noticeable when taking into account the eagerness for the madness to begin. Throughout the grounds it was easy to find entertainment apart from the music. Walking into the main venue was a completely different experience every time around. During the daytime, mushrooms, butterflies and confetti were the main attraction. Bacardi sponsored mini castles featured beautiful dancers and good drinks. Fully dressed characters interacted with fans and give-aways were at every corner. T-Mobile made sure to leave an impact by placing cell towers and having “T-mobile users only” pool parties at their own skyloft. Bud Light was giving away free pictures and hair makeovers to match the overall steampunk theme. Numerous food stands and beverage places littered most of the stages. The ‘no cash’ concept of the festival was a bit pricey seeing as how a “Pearl” (Dreamville currency) was about $2 and most small dishes were at least 5 pearls. The main stage had the biggest house acts that would mix and mash their own tunes with crowd favorites. Totem poles flooded the view from above as waves of hands went up and down. One of the gigantic tents was like a scene out Alice in Wonderland while another was steampunked with knots and maneuvers going together in synch. Floating mushroom rocks and vines connecting lights to the artist platforms gave a great reason to break off from the main screen and look around at the magical surroundings. Going from one side of the venue to the other was a fun mission that usually consisted of keeping your balance to keep from falling into pits of mud. Light filled paths led music goes through metal bridges that crossed fire breathing fish and lit up water fountains. A boat stage hosted artists while a den overlooked by a steep hill made up a two story venue for fans. The lineup seemed limited compared to past years. Each stage has its own headliner divided by genre and style. There was something for everyone at the alternating stages throughout the festival: Hospitality Stage, Smash the House with frenchmen DJ Snake and Tchami, Thomas Jack’s boat and friends, all gone PETE TONG, the ever famous Qdance Stage, and many others. Crowd favorites like The Chainsmokers, Borgore, Bingo Players, Tritonal, Kaskade and Laidback Luke kept the mainstage busy at all times. Ne Yo made a special appearance but nothing was as surprising as enjoying Shaq’s set on a Friday night. Mythical Frames hosted the best featuring beat boxing guru Reeps One,the groovy Gramatik, a banging performance by Seven Lions and an always amazing close by BassNectar. It wasn’t until the second day after failing to get over a field of mud in flip-flops that I realized barefoot or boots was the only way around TomorrowWorld’s Dreamville. On Sunday morning, pictures proved to festival goers how impacting the weather had been on the night before. Those few that had chosen to attend the festival on Saturday to then leave after the last performance had been stuck out in the mud due to the hazardous unpaved roads that led to all exits. They had been closed down to all traffic leaving many stranded miles away from help or shelter. That Sunday, the TomorrowWorld information booths let Dreamville residents know that the day’s schedule had been rearranged to fit all artists into the remaining stages since three had been shut down. Entrance to outsiders not part of Dreamville had also been restricted . Throughout the day, helicopters could be seen going in and out of the trees bringing in the few outsiders to the last day of magic. That afternoon, Dreamville residents rejoiced since VIP and premium skylofts were open to the general public. Even though three stages were shut down, blocks of hay were spread all over the remaining fields to efficiently soak up most of the mud. There were many performances that surpassed my expectations. 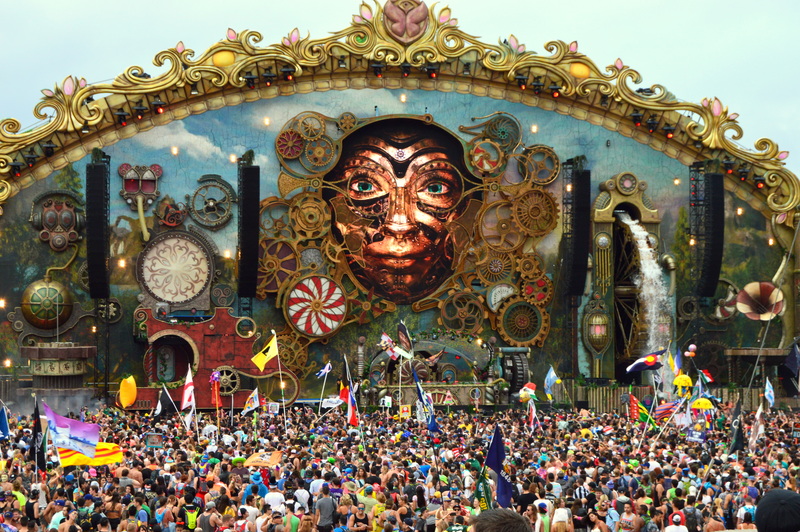 On a stage that was shaped in the butterfly Tomorrowworld logo with water moats outlining the shape, party people were splashing around to the best trap. Milo & Otis had their best set followed by action packed Flux Pavillion who then passed the bass to Excision. Rudimental gave one of the best live shows featuring their talented singers and good looking men jumping up and down with more energy than could fit in the tent. Big Gigantic continued long before leaving the stage for Porter Robinson’s set. After a few technical difficulties the artist’s performance was cut short and altered into a DJ Set. The mainstage had the best closing show with over the top production and lasers comparable to Defqon’s. Armin Van Buuren’s set featured new tracks from his upcoming album. Overall, the most repeated songs that weekend were inarguably Galantis’ “I wanna run away” and Skrillex’s “Burial”; all in different remixes depending on the artist. It was easy to conclude that everyone had been in denial about the weekend’s forecast. Exiting the festival was a wet and mucky process. Circus like carriages were ready to give a lift toward shuttles that would then transport the fans to a line of Ubers. The overall feel of the festival was wet but positive. It was almost impossible to find someone without a smile on their face. As festival attendee, Vince Perez, stated: “through mud soaked fields and rain filled skies we persevered and made the best out of it.” Tomorrowworld remains being one of the best produced festivals of our time despite this year’s muddiness of it all. It remains a Disney type magical place where you can go and leave all your worries behind while enjoying the positivity of others and grooving to the best of Edm under a sky full of fireworks.